"It's more vibrant. I didn't want the boring all-day lectures kind of thing. Her school has one room per subject with loads of materials for hands-on exploring and creating. All I care about now is nurturing her love of learning and the passion to search, unlike the conventional memorize and recite cycle," Sara el-Kady said, explaining why she chose to enroll her daughter in a school that customizes the learning experience to each student's individual needs. After Malak, el-Kady's daughter, finished nursery, her parents were looking for a student-centered school that allows children to learn based on their cognitive skills, yet also unleashes their passion. "I didn’t have many options after Malak finished nursery and the extremely limited options left me unimpressed. I was thinking about home schooling until I learnt about Mavericks school," the 27-year-old mother said. Mavericks schools follows a method of education called blended learning, by which the school employs up-to-date technology in a manner that allows them to customize the learning experience to each student's individual interests and inclinations. The school follows the American learning standards — but applies them in a manner that considers Egypt as its context, the school's website described. At first, el-Kady was largely confused by the school's approach and style as they integrate science, technology, engineering, arts and mathematics through inquiry and projects, and ensure it is completed in a student-centered manner to address everyday problems and questions that shape the students' experience in life. "I didn't really understand until I went to the orientation. The positive discipline system is what pulled me in: the mutual respect between students and teachers, and how there's always a discussion to reach solutions together," el-Kady said, citing the characteristics that encouraged her to enroll her daughter to Mavericks. The classrooms are not set out traditionally. They add gardening, yoga and mandella classes, which is something impressive, el-Kady said. El-Kady added that her five-year-old daughter's personality "bloomed." She described her daughter now as naturally curious about all her surroundings and eager to ask questions. Egypt's traditional education system, howver, is generally based on a large number of students attending school for a certain number of hours during a fixed semester. These students follow uniform educational curricula determined by the Ministry of Education and are subjected to assessment and academic tests that do not take into consideration individual differences among students, which causes teachers to constantly grapple with the age-old challenge of capturing the kids' attention and maintaining their engagement. "The teachers guide, they don't teach. It's a new approach and it will take time for everyone to adapt to it," el-Kady said, adding that the tuition fees are much cheaper when compared to other American schools. The school's fees range between LE37,000–LE40,000. They currently accept students from Kindergarten to Grade 5. El-Kady commented that Mavericks may seem like a big risk for parents as it's a startup that is still trying to implement an innovative system. She explained that next year they'll have the chance to evaluate teachers' performance for the students in older grades, noting that if they are not satisfied, they'll start looking for other options. Egypt Independent reached out for an interview with the CEO of Mavericks, but he wasn't available for comment. Engy Hatem, a mother of three boys, is totally against implementing this new learning approach for all students, saying that different approaches fit different personalities. "Ibrahim, my youngest kid for example, prefers one-on-one communication. An environment [like Mavericks] would be very intimidating to him, he wouldn’t follow," she said. Unlike Mavericks, a start-up that is still trying to get its feet on the ground on the educational arena, Montessori schools have been popular around the world for more than a hundred years, but the system hasn’t gain much attention from educators in Egypt yet. Montessori is an educational approach that features multi-age classrooms grouped into clusters of three grades, starting with 3-year-olds. Self-directed activity, hands-on learning, collaborative activities, and tactile objects for exploration are key features of Montessori classrooms. This system allows children to make creative choices in their learning, as the teacher offers age-appropriate activities to guide the process. Very few schools in Egypt follow this approach that was developed by Italian physician and educator Maria Montessori in 1907. 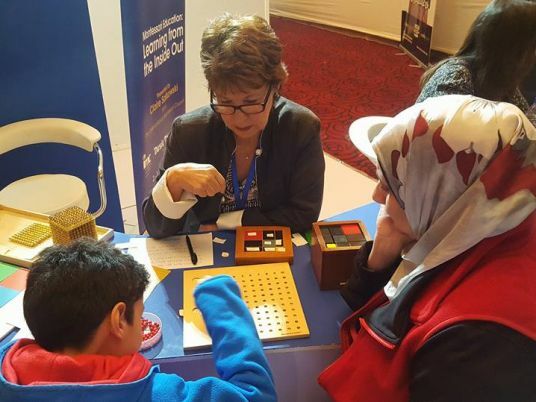 Aspiring to follow the Montessori system, while still maintaining Egypt's heritage and culture in the learning process, Rasha el-Geoshy founded the Gateway International Montessori School to provide students with a solid academic foundation to prepare them to be "problem solvers and inquisitive learners". The school will start operating in September 2017. El-Geoshy said the school's approach will be slightly different, and catered to the target demographic of students in Egypt. "It's a shame we [Egyptians] forgot about our Arabic language. It's because we are constantly exposed to the traditional means of teaching Arabic, which leaves uninterested students behind," she said. El-Geoshy mentioned that students are often unable to generate ideas in Arabic, but can perfectly express themselves in English, which is why she was keen to revolutionize the Arabic curriculum in her school by following the Montessori learning approach on all subjects chosen by the Ministry of Education. "We need to be creative to spark the students' interest in what is most important, and if we do not appreciate our own language, how are we going to appreciate anything else?" she said. She is planning to introduce an ethical behavioral program to supplement the teachings of Arabic and religion in the state's curriculum. She added that the traditional approaches to education do not promote the skills children need when they grow up. It's more important for kids at this age to understand the principles of the verses when they read the Quran, not merely memorize them for the exam, she said. El-Geoshy added that students will still be learning from the curriculum imposed by the Ministry of Education, and they will undertake the ministry's examinations in key stages; however, the material will be taught creatively to ensure the student's interest in the subject is maintained. The Montessori system ensures that students follow the curriculum at their own pace, respecting each child's development in various aspects. The school also assigns one foreign teacher and one Egyptian teacher to guarantee a balance of culture within the classroom. Sherine Badr, a graduate from the faculty of education at Ain Shams University and a class teacher at a Cairo nursery, believes that this method of education can prove very effective as long as it's managed properly. "No doubt it sparks their interest in learning from a very young age, but it's very hard to implement; two teachers won't be enough to manage all the different personalities a classroom may hold," Badr said. Badr suggested that students who share similar interests can be put in small groups and each group to be led by a teacher and a co-teacher. "Otherwise teachers will be put under pressure and students won't get the adequate attention they need," Badr said, adding that mixed-age systems can sometimes be risky as children imitate each other's actions. El-Geoshy, however, explained that mixed-age school systems can help heighten students' communication skills and challenge their eagerness to learn. "We keep telling students to think outside the box — these kids in Montessori live outside of the box, they have no box … their minds are limitless," she said. Gateway International Montessori School provides an American and Montessori education model with the purpose of complementing the American High School courses with the International Baccalaureate in Grades 11 and 12. The school's fees ranges from LE65,000 to LE75,000.